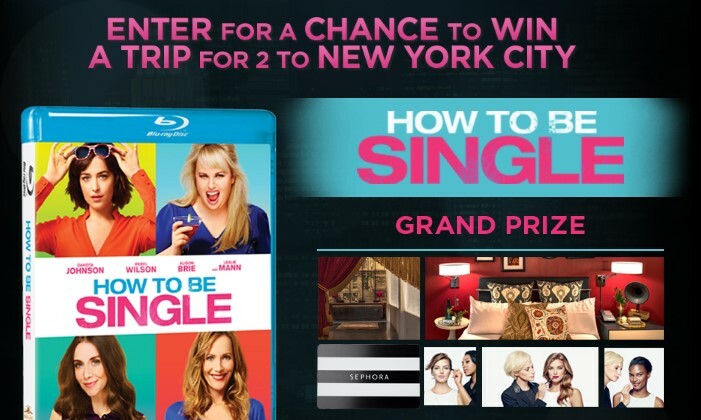 Warner Bros. Entertainment is giving you a chance to enter daily to win a trip for two to New York City, complete with flights and hotel, makeovers at Sephora, dining, a $500 gift card and the How To Be Single Blu-Ray! Runner up winners will score copies of the Blu-Ray, too. Grand Prize winner will receive a 3-day/2-night trip for two (2) to New York, NY (“Trip”). Trip includes; economy class round-trip air travel from a major commercial airport near Grand Prize winner’s legal U.S. residence (as selected by Sponsor) (“Airport of Origin”) to a New York, NY area airport (as selected by Sponsor); two (2) nights’ hotel accommodations (standard single room, double occupancy) at The Redbury New York; round trip ground transportation to and from New York, NY area airport and hotel; one (1) dinner for two (2) at Marta Restaurant; one (1) breakfast for two (2) at Marta Restaurant; two (2) $100 Sephora gift cards (subject to terms and conditions thereon); two (2) 60 Minute Makeovers at a Sephora in New York, NY; $500 in cash or cash equivalent; and one (1) Blu-ray of How To Be Single. ARV of Grand Prize: $4,097.99. First Prize (25 winners): Each First Prize winner will receive one (1) Blu-ray of How To Be Single. ARV of each First Prize: $29.99.